Picture this – you, soaking in fragrant bliss in a cocoon of bubbles. The warm water laps at your toes, there’s a cool glass of wine at your fingertips, and you’ve got the latest Nora Roberts close to hand. Maybe you even went the extra mile and have some Zen zither and flute music playing, and some scrumptious vanilla aromatherapy candles burning. But alas! Something is amiss – your head has no support, so you’re either lying on the cruel edge of the tub or sitting up, leaning awkwardly, straining your neck. You need a bath pillow. These little lifesavers are the type of thing where you say ‘I never knew I needed this!’ but once you’ve tried it, you’ll never go back. They are very affordable, too. Every bath pillow you might find on Amazon is under 40 dollars and some are under 10. The only problem is that there are hundreds to choose from. That’s why we’ve made this list to help you choose the best bath pillow you can invest in. Our research suggests that with one of these bath pillows you’ll increase your bath relaxation and de-stressing by approximately 86.49%. 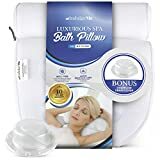 The Ideaworks Home Spa Bath Pillow is one of the larger choices for best bath pillow in our list, at its size of 14” x 13” x 4”. The fabric is of a breathable fiber weave that makes it resistant to water, mold, and mildew. It also lets you spot clean it without any hassle. This is good news for anyone who dislikes having high-maintenance bath accessories. It will also dry pretty fast—no more excessive waiting around for it to dry before you can put it away. The fabric is soft enough that it won’t scrape or irritate your skin. The design divides the pillows into two portions, with one part shaped to bolster your neck without causing strain on your muscles. It’s quite easy to install on various types of bathtubs, with its design keeping it hooked on tight even in hot tubs and Jacuzzis. This bath pillow is pretty durable and will last you through a good many uses. It can take some wear and tear without falling apart on you. Our next best bath pillow recommendation is the Estilo Luxury Bath and Spa Pillow. True to its name, the Estilo Luxury pillow is designed to cup your neck and shoulders in extravagant style. The interior is filled with foam especially geared towards both comfort and support. The design has a double-panelled cradle head for ergonomic support while you relax. It’s pretty light and handy to transport, so that you can take it with you when traveling for some quick down time. This bath pillow is made to be resistant to water, chemicals, and odors, which is always a plus. Who wants a smelly pillow stinking up their bath? This makes it pretty low-maintenance. It has 7 suction cups to make sure it stays in place where you install it. 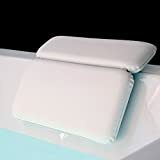 The Spa bath pillow, with its generic name, nevertheless has a not-so-generic style that makes it a contender for the crown of ‘best bath pillow’. It’s designed in 3 folding panels to make it easier to adjust and provide better support for your head, neck, and shoulders. You need not fear chemical odors from the Spa bath pillow. It’s also mildew and mold-resistant, so you don’t need to spend your valuable time cleaning it up. It would be higher on the list if so many customers hadn’t reported problems with the suction cups – it worked fine for us, but for many it seems to slide around the tub. Some people think it’s a bit on the thin side. It comes as no surprise to see Serene Auras on our list of challengers for best bath pillow, as it’s a trusted brand for this line of products. Their Luxury Bath Pillow model is one of the most popular and sells by the boatload. Designed with a dual chamber, the pillow provides comfy support for the head, neck, and shoulders while being oriented towards maximum relaxation of the muscles. The split-sectioned style enables ergonomic cradling for your head to shoulders despite the material being quite soft. The sleek design also makes it easy to clean. Notably, it has a temperature adjustable design that lets it function equally well in both hot and cold water. It has 7 suction cups for installation so that your bath pillow only comes off when you want it to. The material is made to be resistant to odors and chemicals, as well as also keeping mildew and mold from growing on it. The most vibrant of our best bath pillows comes in a trio of assorted terry cloth choices for you to choose from. Who doesn’t like being able to pick their favorite color (if your favorite color is white, purple, or blue, that is)? Or, if your home is perfectly color-coordinated, you don’t need to suffer the pain of having a blah green pillow that just doesn’t go with your trendy black-and-white bathroom. Soak yourself in style, with the colors you like! Apparently, white is a lot less popular than the blue and purple shades, but note that the link below takes you to the white version because they don’t always have the colored ones in stock. The Aquaesentials Inflatable Bath Pillow has a couple of other factors to recommend it, of course, aside from the undeniably fun color factor. The terry cloth material is a draw for people who find it comfy and soothing, as well as being quite durable and able to last you a long time. It’s sectioned into 4 parts for easy manageability and adjustment, and gives good support for your head, neck, and shoulders. At 23” x 15”, it’s large enough to provide good coverage. Finally, it’s got 4 suction cups, which—while fewer than the usual 7 that premium bath pillows have—is decent enough for keeping it stable once you install it. One of the more affordable models on our list of best bath pillows, the Balance bath pillow is just soft enough to send you to sleep, and firm enough to support your head, neck, and shoulders while doing so. It’s sectioned into split parts for your convenience in handling and adjusting it, as well as for more optimal support. 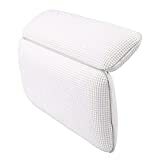 This ergonomic bath pillow can be installed in various kinds of bathtubs, including hot tubs and Jacuzzis. Its 7 powerful suction cups let it stay steady when in use once you’ve installed it. 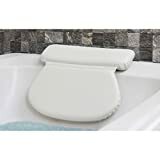 The Balance bath pillow has a vinyl cover that’s resistant to chemicals and odors. It also prevents the unwanted growth of mildew and mold. It’s easy to see why the Harrison House/Cloud 9 Bath pillow is a favorite. Unwind, relax, sink into the pillow and let the warmth of the bath take you to cloud nine. As with most of the pillows in this list it’s mildew resistant, dries quickly, and is really comfortable. There are two main selling points to this one – first, its size. This is extra large! 14 x 13 x 4 inches, in fact. It might take you a minute to get used to, but we’re sure you’ll come to love it. It’s not only the pillow that’s outsized – the suction cups are larger too. If you’ve had problems getting a bath pillow to stick in place, this one might work better. Second, there’s the unexpected bonus of a bath sponge or a facial sponge (the facial sponge costs a bit extra, but less than its retail price). This is one of the pricier bath pillows on this list, but it comes with a 10-year warranty. The delightfully named Zleepi Soft Terry Bath Pillow is just as comfy as it sounds. Each candidate for best bath pillow is made to be ergonomically comfortable while providing optimal support, and Zleepi Soft does just that. It’s made with durable terry cloth that’s both water-resistant and soothing on your skin. The design allows it to be easily set up in any tub via the usual powerful suction cups. There’s a foam insert inside it that adjusts to your body shape even as you move around, without dislodging the pillow from its position of importance. It also dries quite fast. And of course—as is much-desired in the best bath pillow—Zleepi Soft is resistant to odors and chemicals, as well as mold and mildew. Serenity’s Now Bath pillow is luxuriously soft and relaxing to use—a strong choice for the best bath pillow for your very own home spa experience. 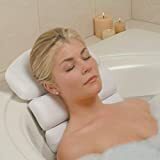 Designed to ergonomically keep your head, neck, and shoulders supported and propped up with no discomfort, it can be easily used in various kinds of tubs. Its 7 suction cups keep the bath pillow steady after installation. The name Serenity Now makes me think about that classic Seinfeld episode! Notably, it has an advanced cooling technology to keep the temperature at optimal conditions for your comfort. It also comes with a soothing gel eye mask that can be used to either warm or cool your eyes, depending on whether you need the comfort of warmth or need the cold to lower eye puffiness. Additionally, the Amazon seller offers a free download of relaxing music to enjoy. This bath pillow is resistant to odors, chemicals, mildew, and mold. The De La Mar Luxury Bath Pillow is a pretty small one compared to its competitors. It’s sized to be easy to pack when travelling, so you can just pop it into your bag without worrying about much wasted space. In line with its ease of travel convenience, this model is made of lightweight material that’s both waterproof and easily washable. Installation in any hotel bathtub is no problem with its powerful suction cups. It’s also made of durable material, so that the bumps and bangs it gets in the baggage area aren’t going to break it apart. The ergonomic contours are designed to remove the strain from your head and neck so that you can relax them as you enjoy your soak. The Epica Luxury Spa Bath Pillow comes up a lot as many people’s nominee for the best bath pillow this year, and with good reason. It’s large and in charge, with an easy-to-handle design that makes it a breeze to use. It’s filled with soft foam for your comfort while the two-panelled design supports your upper back with no slippage—thanks to the 7 powerful suction cups used to keep it in place. 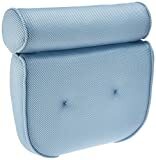 The design allows it to bend around the edges of the tub while cushioning your head and neck against these edges. The interior foam is soft enough to feel like an air pillow, only a lot more durable. Additionally, it adjusts to your body temperature as you lie back on it, heightening your relaxing home spa experience. It’s priced quite affordably, dries fast, and is easy to clean. And as you can expect from a top-rated bath pillow, it’s odor, chemical, mildew, and mold-resistant. Popular worldwide, the Original Gorilla Grip is the reigning champ as the most widely acknowledged best bath pillow. The name is derived from its Gorilla Grip suction cups that they promise can grip any smooth surface with the power of…well, a huge primate. They place utmost priority on your bath pillow not rudely slipping off in the middle of your relaxation session. Who wants to get their head bumped painfully against a bath tub edge because of loose suction cups? Not me, for sure. This model is nice and large at 14.5” x 11”, perfect for relaxing without worrying about keeping your head confined to the pillow area (roll your head around to your heart’s content). It’s filled with over 2” of luxuriously soft foam, and covered with premium waterproof material made to be soft and smooth to the skin. Its design allows it to fit around the edges of various bathtubs, Jacuzzis, and hot tubs. Most impressively, it also comes with a 10-year 100% refund guarantee, no questions asked. Now that’s confidence in your products. Note the suction is REALLY strong, so take care to ease it away from the tub when you want to clean. I ripped my first one! The best bath pillow for you will depend on your specific needs. Some of those on our list are perfect for the jet-lagged traveler who needs some down time, while others are made for those who just want to enjoy some home spa time on their own. Take your time in picking one, because a good bath pillow makes a crucial difference between an ordinary bath and a home spa experience. You’ll want one that’s ergonomic enough to keep your neck from cramping up, easy to handle (who wants to be stressed out after you just finished de-stressing? ), and that fits your bathtub. Good luck, and happy soaking!